Join the St. Stephen's family for Pancake Dinner. 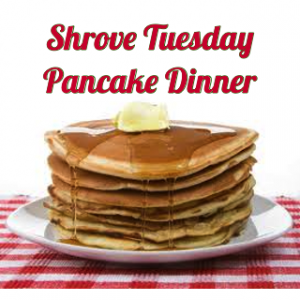 Shrove Tuesday is the last day of what traditionally was called “Shrovetide,” the week preceding the beginning of Lent. As we prepare to begin Lent, perhaps after a hearty dinner of pancakes on Shrove Tuesday, may we take time for extra prayer, particularly the Stations of the Cross, and various penances to overcome our weaknesses and to atone for our sins. Soup dinner server at 6:00pm in the Rectory. Stations of the Cross at 7:00pm in the Church.